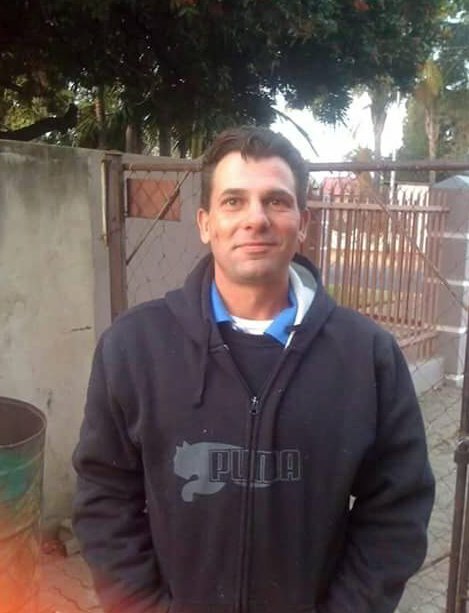 Kobus Koekemoer stands accused of killing his three-year-old stepdaughter, Poppie. This is what some shouted at the alleged murderer of three-year-old toddler Poppie van der Merwe from inside a packed magistrate court on Thursday. Poppie’s stepfather Kobus Koekemoer (43) appeared briefly before magistrate Moses Mswanganyi in a short-sleeved checked shirt and long pants. Through an Afrikaans translator he asked for a two-week postponement so that he could appoint a lawyer. The court ordered that his bail application would only take place on 17 November. Many angry protestors, campaigning for justice for the young victim, demonstrated outside the court before and after proceedings. Little Poppie allegedly died tragically at Kobus's hands last Wednesday. The community also stood together to campaign that Kobus is denied bail. “Today I’m standing up for all the Poppie’s in this country,” Nana Swart (67) of Hartbeespoortdam told YOU outside the court. 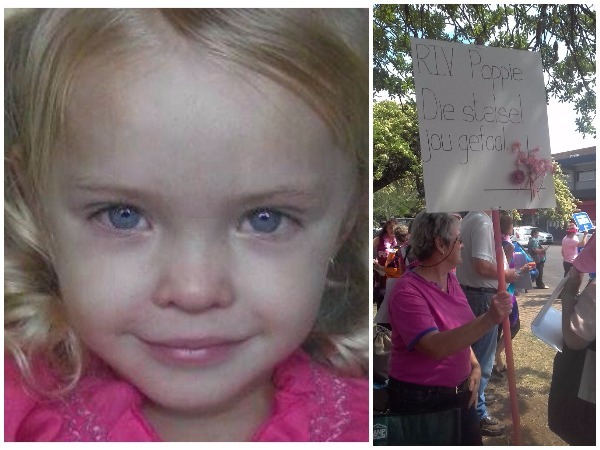 The protestors at the court wore pink and released pink balloons in memory of Poppie. It is believed that Kobus injured Poppie so badly on their farm close to Mamogaleskraal that she was announced dead on arrival at the local hospital that fateful night. The toddler lived on the farm with her stepfather, her mother and older half-brother. The six-year-old boy is in the mean-time been taken into protective custody while his 15-year-old half-sister is with her biological father. All three children have different fathers. Lt col. Pelonomi Makau, provincial police spokesperson in the North West, earlier confirmed that Kobus was arrested on the night that Poppie was brought to hospital and is facing a charge or murder. While the details of Poppie’s post mortem haven’t yet been revealed police have confirmed that she suffered injuries all over her body. She was apparently beaten and kicked. Her funeral will take place on Friday at the Reformed church in Westonaria. Christo van der Merwe, Poppie’s biological father who lives in Westonaria, earlier told Huisgenoot that he is broken and is struggling to deal with the death of his child. He says that since he hasn’t had a decent night’s rest since the death of his child. “I am consoled by the fact that Poppie is with Jesus now. I was so blessed…” he told YOU while crying. He revealed that over the years he saw his daughter very rarely. The little girl’s death has rocked the country after the Facebook group Truth and Justice Continue shared information about the incident and photos of Kobus and Louisa were shared. I'm a 50 year old woman looking to meet men between the ages of 48 and 69.